I never took Latin. The itranslate app was necessary to unravel the mystery joke with the clue provided. It was like an episode of Scooby Doo without the sexual tension between Fred and Daphne. Except the criminal was already caught. I hope some meddling kids were involved in her capture. Be sure to try her "Potatoe Casserole" recipe. "This is hate B.S. corpus, your honor; and it's ecce homophobic." I never knew we had a Universe Code. Should I put that on all correspondence? I was thinking this was some quantum entanglement/parallel universe joke, given the "universe" tag. Then again, I should probably stop binge-watching Fringe. I don't understand the purpose of this post (yes, I get the pun). Why is this on IMAO? Are we supposed to recognize her? Followed the link, and the mug shot is #15 of 82. 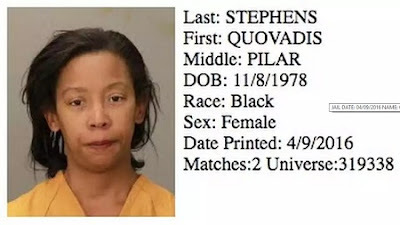 "JAIL DATE: 04/09/2016 NAME: QUOVADIS ... CHARGES: OBSTRUCTION OF A POLICE OFFICER (F);SIMPLE BATTERY"
Googled her name. Navy veteran. I still don't get it. Please consider putting the post in the trash bin. If removal isn't an option, maybe edit out the links, DOB, middle and last name. This post about a private citizen seems unnecessarily mean to me. Thanks. Quovadis = where are you going?